Supporters of industrial energy efficiency and combined heat & power (CHP) can breathe a sigh of relief, and might be allowed some guarded optimism as a result of the recent FY2013 appropriations mark-up by the House Energy and Water Appropriations Subcommittee (E&W) that was approved by the Committee on Appropriations Wednesday, April 25. The appropriation for the Advanced Manufacturing Office (AMO, formerly the Industrial Technology Program) is up $34 million over FY2012 to $150 million. This is particularly notable as funding for Energy Efficiency and Renewable Energy (EERE) overall is down 24% (-$428 million) from FY2012 and $886 million less than the Administration requested. The Advanced Manufacturing Program, formerly ITP, will fund activities that help American Manufacturers compete in a global market place. 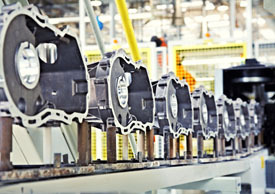 Energy costs are a major contributor to manufacturing costs, and technology innovations that steeply reduce energy consumption in manufacturing and industrial processes can give American manufacturers competitive advantages in the global marketplace. This outcome is important to supporters of AMO’s research, development, and deployment programs as it indicates an appreciation for the role of government in advancing energy efficiency and next generation technologies for manufacturing. Two programmatic areas singled out for dedicated funding are advanced materials and CHP. The appropriations bill allocates $19 million to create materials such as carbon fiber or woven titanium that will have superior performance to conventional, generic stocks. The bill also allocates $6 million from the Buildings program budget and $19 million from the AMO budget for CHP to take advantage of this critical energy efficiency opportunity. 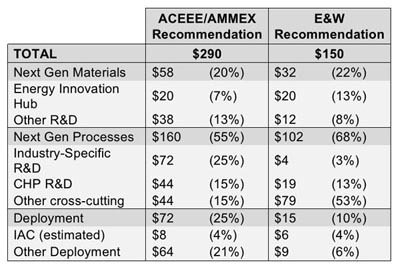 As the chart below indicates, the mark-up allocates AMO funding in a similar ratio to what was recommended last month by ACEEE and the Alliance for Materials Manufacturing Excellence (AMMEX) for the administration’s $290 million request, although we would have preferred to see more focus on industry-specific R&D and deployment activities. While passage of the appropriations bill by the House Appropriations Committee is an important step forward, supporters should not start celebrating just yet. The bill now needs to pass the full House and be sent to the Senate for consideration. If last year’s budget process is any indication, we are not likely to see an appropriations bill for DOE funding adopted before the fall elections. We are likely to see one or more continuing resolutions (CR) at least through the end of the lame-duck session that provides funding for the start of FY2013 on October 1. All the same, having strong support for manufacturing and CHP in the appropriations bills does offer hope for an eventual positive outcome. For its fiscal year 2014 budget request, as directed under ‘‘Financial Reporting’’ above, the Department is to return to the same level of detail provided in the fiscal year 2012 budget request. The take away here is that Congress is watching and cares about the details of this important program. Appropriators seem keen to fund the program, but their support is conditional upon clear strategic vision and a transparent program direction. For those of us in the energy efficiency and CHP communities, it means continued support of technologies and practices we care about, but for our country, it could mean a stronger economy and a brighter future. Dan Trombley provided the budget analysis for this blog post. The Senate Committee on Appropriations submitted its committee report on the Energy and Water Development appropriations late last week and there is considerable distance between its support of the Department of Energy and that of the House. The overall Senate recommendation of $27.1 billion for the US DOE is much closer to the Administration’s request of $27.7 than the $26.1 recommended by the House. Several US DOE programs of interest to ACEEE such as the Advanced Manufacturing Office, Energy Information Agency, Building Technology, and ARPA-E all fared better in the Senate than the House (see table below). As the bill moves through the process, there continues to be cause for optimism.